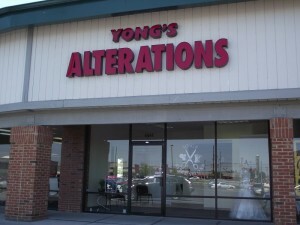 Yong’s Alterations Provides Expert Wedding Dress Tailoring in Indianapolis! Here at Yong’s Alterations, our expert seamstresses are happy to provide the professional wedding dress tailoring services all brides desperately look for in Indianapolis. We are located on the corner of 82nd Street and Allisonville Road, in Castleton. We are extensively experienced, highly trained, and highly accomplished tailors that retain a variety of professional accolades and local recognition for our talent and unwavering customer service. Our owner, Yong Lischinsky, has been formally recognized and awarded for all her accomplishments and hard work in the alterations industry. She has more than three decades of experience working as a professional tailor for men, women, children, and even home décor. She has studied in Korea and Germany, and is an esteemed graduate of Dress Design School International. Indianapolis Monthly Magazine recently voted her store as “Best Alterations” in Indianapolis. You can trust that her experience, mentoring, and equally-proficient team of seamstresses can undertake any wedding dress alteration or repair you need! Aside from expert proficiency in wedding dress alterations, she and her team of talented tailors also provide superior bridal wear alterations, tuxedo alterations, alterations for table linens and curtains, and much more. Yong’s Alterations is truly your one-stop-shop for all your wedding tailoring needs! On top of providing expert wedding, bridal, and tuxedo alterations, we also offer alterations for men’s suits, shirts, pants, and more, as well as, women’s clothing, garments, children’s clothing, costumes, prom dresses, curtains, draperies, and much more! Call Yong’s Alterations at 317-845-9077 for information about wedding dress alterations in Indianapolis, Indiana. Speak with a friendly and professional seamstress about your wedding day alteration needs, tuxedo alterations, bridal wear tailoring, and more. We are happy to provide free over-the-phone quotes, but keep in mind that we need to see the garment before giving a final cost estimate. Call 317-845-9077 and schedule an appointment for wedding dress tailoring in Indianapolis, IN today! This entry was posted in Wedding Dress Alterations and tagged alterations Indianapolis, bridal wear alterations, bridal wear tailoring, bridesmaid dress alterations, Indianapolis tailoring services, tuxedo alterations, wedding alterations, wedding dress alterations Indianapolis, wedding dress fittings, wedding dress tailoring, wedding dress tailors. Bookmark the permalink.